Your bedroom is a place for peace and sleep. Don’t let necessary items become slumber-reducing chaos by not having a place to store everything. Having a nightstand is a must for most bedrooms. Without a nightstand, you have no place to put a lamp, set your mobile device while it's charging overnight, or keep a glass of water handy for middle of the night thirst. In most cases, nightstands operate as mini storage units. Look for one that fits the style of your bed for a cohesive appearance. Remember to measure your bedroom in advance to make sure you have room for your favorite nightstand. 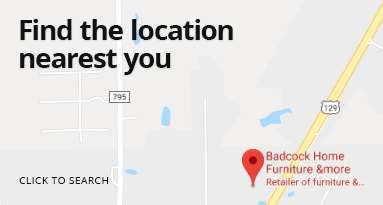 At Badcock Home Furniture &more, we have a large assortment of nightstands, dressers, chests, and other bedroom furniture in a variety of styles. Make your dream of a perfect bedroom a reality with our easy financing. A bedroom set isn’t complete without a beautiful nightstand, and this piece from the Belmont Collection fits that description perfectly. This sophisticated piece will add refinement to any existing décor with its antique bronze hardware and faux crystal knobs. Pair it with the rest of the Belmont Collection, and you can’t go wrong. The pared-down chic aesthetic of this 2-drawer nightstand will bring elegance to any décor for years to come. This transitional piece is constructed of Okoume wood fronts and select Asian hardwoods and finished in sleek black, giving it the perfect mix of exotic flare and traditional shapes to put a little spice back in your bedroom decor. Encourage your child’s love of the outdoors while keeping up with the latest trends. You’ll love the classic craftsman style, clean lines and rustic, distressed grey finishes. Round, gunmetal grey handles on the 2 drawer nightstand bring masculine style. Add a bit of elegance to your bedroom with this charming nightstand. Made with the details in mind, the Deacon nightstand offers a rustic look with a contemporary feel, and its two drawers give you ample bedside storage. It’s time to start your day off in style and update your bedroom aesthetic. Stunning, sophisticated and versatile, our Diplomat Collection fits right into to any design scheme. With sleek features, like rich, retro-looking finishes on the solid wood drawer pulls, it’s perfect for bringing a bold, distinguished look to your bedroom. Three drawers offer you handy bedside storage with the elegant look of classy silver hardware. It’s the perfect spot for a lamp so you can curl up and enjoy a good book before a good night’s sleep. This merlot childrens nightstand is a great way to accessorize in your childs room while having even more storage space. Other pieces sold separately. 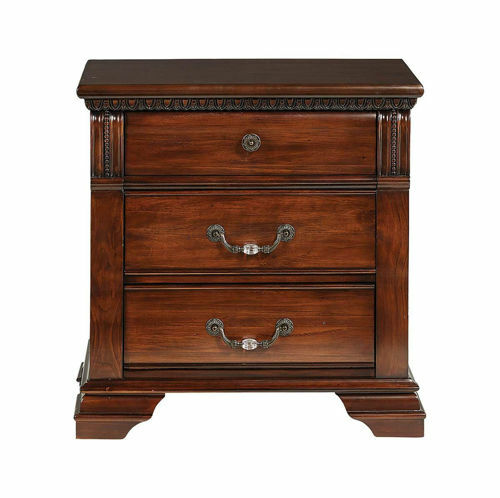 This regal nightstand will change the entire feel of your bedroom for the better. Its marble top and felt-lined drawers give it an impactful appearance and stately, heirloom quality. Add this beautiful piece to your decorative palette and watch the entire ambiance of the room emanate with old-world craftsmanship. Each Homestead nightstand includes three solid pine drawers with metal positive stop guides for handy bedside storage. The drawers have French dovetail fronts and dado dovetails backs. The hand-applied distressed gray finish and brass gunmetal cup pulls fall beautifully in line with the rest of this versatile collection. Add the ultimate bedside piece to your room with a nightstand from the Keaton Collection. It’s rustic yet modern dovetail grey finish will complement any room color, and it is guaranteed to mix nicely with a variety of other styles and furniture. Purchase the other stunning pieces from the Keaton Collection and include all the ingredients necessary for a soothing sleep space. The details on this nightstand bring the look of an island shutter overlooking the porch of a tin roofed house somewhere where the suns always shining and the temperature never drops below 75. When this piece meets the décor of your bedroom, it's sure to bring some Island calm to your home. Other pieces sold separately. 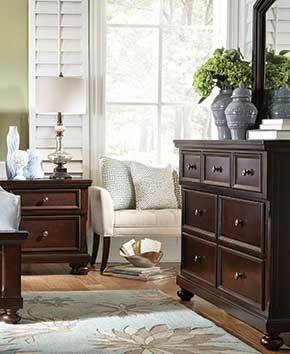 When redecorating your bedroom, our Lewiston Nightstand is the final piece of the puzzle. With a grey finish that’s understatedly beautiful and slender ball handles in a brushed nickel color, it’s 22 inches wide and has two drawers for convenient storage. Inspired by French classic Louis Philippe furniture, the Lewiston 2-drawer nightstand offers grand silhouettes, subtle curvatures and striking design. Trim and streamlined, this nightstand presents a contemporary version of the ever-popular Louis Philippe style. Constructed of quality engineered wood products and simulated wood grain laminates finished in a sleek cherry color. The Mossy Retreat nightstand is a practical solution for storage that can be kept handily next to the bed. It contains three roomy drawers and is made from yellow pine with a slate finish. Complete your bedroom set with this rustic Nashville nightstand. This piece has a gorgeous weathered pine finish and metal barn door accents that make it the perfect upgrade for the modern home. It even comes with a metal basket to add the finishing touch to your bedroom.